Heat oven to 400°F and grease 8- or 9-inch square pan. Combine cornmeal, flour, sugar, and baking powder into a large mixing bowl. Add egg, oil, and milk to flour mixture. Mix until ingredients are well blended. Bake 20 to 25 minutes, until firm to touch or wooden pick inserted in the center comes out clean. Buttermilk Corn Bread: Use only 2 tsp baking powder and add ¼ tsp baking soda. Substitute 1 cup buttermilk for skim milk. Corny Corn Bread: Add 1 cup kernels (fresh, frozen, or canned, well drained) with the milk. Cheesy Corn Bread: Add ½ cup shredded cheddar cheese with the milk. Chili Cheese Corn Bread: Add ½ tsp chili powder to the flour mixture. Drain one 4 oz can chopped green chilies. Add chilies and ¼ cup shredded Monterey jack cheese with the milk. Blueberry Corn Bread: Fold 1 cup blueberries (fresh, frozen, or canned, well drained) into the batter. 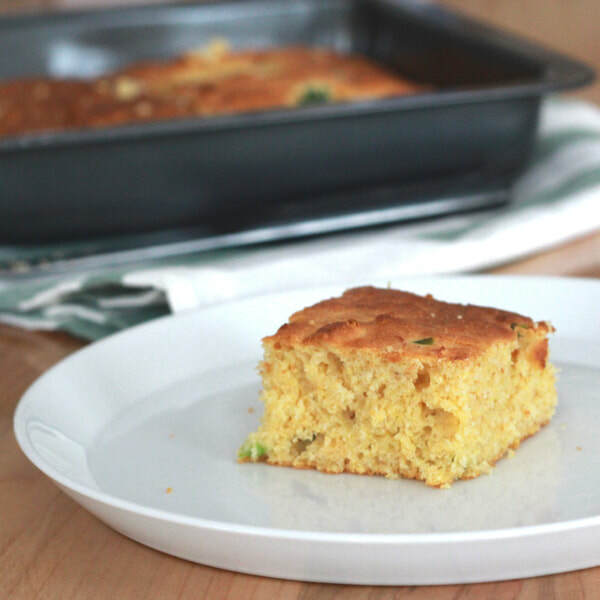 Spicy Corn Bread: Add 1 minced jalapeño to batter after all other ingredients have been added.